Clustered around the banks of the Sông Hương (Perfume) River, Huế is a quaint city in the Thừa Thiên–Huế province and the imperial capital of Vietnam held by Nguyễn feudal lords during the 18th to the mid 20th centuries. Well, until the French, then later the Japanese and then the French again and finally the Americans, interceded. No doubt, for typically myopic home politicians, this was way too much dominion for locals but bred sublime cuisine. Huế, sometimes referred to as the City of Ghosts, is centrally located on the Indochina peninsula, a few miles inland from the South China Sea with verdant mountains nestled behind…and vast palaces, pagodas, colored tiles, rice paddies, tombs. A culture where ancestors never die. Huế was the royal capital until 1945, when then emperor Bảo Đại abdicated, and a government now convened in Hà Nội (Hanoi). Huế was the site of perhaps the most ruthless battle of the Vietnam (or American) War. At the height of this costly and equivocal conflict, there were some 500,000 American troops in the country. Only a rather small percentage of the US public even knew where Vietnam was located. In preparation, Vietcong troops launched a series of attacks on isolated garrisons in the highlands of central Vietnam and along the Laotian and Cambodian frontiers. Then, one early morning in late January, 1968, Vietcong forces emerged from their dark tunnels and holes to launch the Tet holiday offensive. In coordinated attacks throughout South Vietnam, they assaulted major urban areas and military bases in an attempt to foment rebellion against the Saigon regime and their American backers. Callous fighting ensued for several weeks, some of the most brutal at Hué — much of which was house to house with US Marines facing overwhelming odds, and the North Vietnamese suffering heavy casualties. Eventually, artillery and air support was brought to the forefront, and then nightmarish civilian massacres occurred. No burials, no altars. Oh, the sublime scents, flavors, sights, sounds of this evocative city. So many ambrosial even balmy and slurpy dishes in the Vietnamese repertoire originated in the Thừa Thiên–Huế region. Bring some water or broth to a rolling boil, and then add the oxtails, beef shank, and pork bones. Return the water to a boil and boil for 5 minutes. Drain the bones into a colander and rinse under cold running water. Rinse the pot and return the rinsed oxtails, neck bones, and shanks to the pot. Add the marrow bones and brisket. Crush the lemongrass with the end of a heavy chef’s knofe and add it to the pot along with the scallions, paprika and fish sauce. Add 8 quarts fresh water and bring to a boil over high heat. Lower the heat so the liquid is at a simmer and skim off any scum that rises to the surface. After 45 minutes, ready an ice water bath, then check the brisket for doneness to ascertain whether the juices run clear. When the brisket is done, remove it from the pot (reserving the cooking liquid) and immediately submerge it in the ice water bath to cease the cooking process and give the meat a firmer texture. When the brisket is completely cool, remove from the water and pat dry. Also set aside the oxtails, beef shanks, pork shanks and beef marrow bones. Continue to simmer the stock for another 2 hours, skimming as needed to remove any scum that forms on the surface. Remove from the heat and remove and discard the large solids. Strain through a fine mesh sieve into a large saucepan. Skim most of the fat from the surface of the stock. Return the stock to a simmer over medium heat. In a spice grinder, grind the red pepper flakes and annatto seeds into a coarse powder. In a frying pan, heat the oil over medium heat. Add the ground red pepper flakes and annatto seeds and cook, stirring, for 10 seconds. Add the shallots, garlic, lemon grass, and shrimp paste and cook, stirring, for 2 minutes more, until the mixture is aromatic and the shallots are just beginning to soften. Add the contents of the frying pan to the simmering stock along with the salt and honey and simmer for 20 minutes. Taste and adjust the seasoning with salt and more honey, if necessary. Arrange the basil, cilantro, mint, cabbage, lemon and lime wedges, and onion slices on a platter and place on the table. Thinly slice the brisket against the grain. Divide the cooked noodles among warmed soup bowls, then divide the brisket slices evenly among the bowls, placing them on top of the noodles. Ladle the hot stock over the noodles and beef and serve promptly, accompanied with the platter of garnishes. This late summer and early fall mark the centenary dawn (1914-2014) of The War To End All Wars. Well done, humanity — as a species, we have been in global conflict and slaughter almost continuously since then. Strife upon strife. So, perhaps a few words about French grub on or near the front lines during The Great War are in order. Much like with latrines and other necessities, les générals and les officiers (generals and officers) always fared far better than les poilus and les soldats (infantrymen and soldiers). Fine cognac and haute cuisine in opulent estates away from the Front prevailed for generals, while pinard or plonk (a cheap, low class wine) and often inedible or even missing rations were issued to the regulars who daily lost their limbs, minds, and lives on the Front. Some background is deserved. Early on, both sides dug a network of trenches on the Western Front that eventually extended for nearly 500 miles each from the North Sea to Switzerland. Each side dug labyrinthine lines of zig-zagging trenches for some 24,000 miles (nearly the circumference of the earth). As few expected the war to last past Christmas, the first trenches were hurriedly made scrapes and shallow pits in the ground — mere hollows dug by soldiers to protect themselves from the rain of metal from the sky, machine gun barrages and incessant snipers. These hastily constructed defenses often flooded and folded. When the front line later stabilized, trenches became deeper and were more elaborately constructed shelters, which became the troops’ home away from home, often far, far away. The conditions in soggy trenches remained deplorable with rampant cases of dysentary, trench foot, trench mouth, diseases, hunger, rats, vermin, and body lice mingling with the horrific stench of diseases, decaying bodies, open wounds, human filth and open sewage. The trench reek alone made it difficult for many to even eat. Because France’s armed forces expanded dramatically from peacetime to the onset of war, the Ministry of War undertook a staggering juggling act to feed the troops. While relying upon a loosely drawn network of foreign suppliers, limited local production, and meager tithes from abroad, the French not only provided for their own troops, but for some allies, colonials, and foreign volunteers. Among other things, French troops were provided at basic training with a bidon (canteen), musette (haversack), gamelle (mess kit), quart and utensiles (cup and utensils). The soldiers usually received two meals a day, breakfast and dinner. While there was no standard time for when the meals were scheduled while afield, breakfast (PDDM — Petit Déjeuner Du Matin) was usually served around 8 or 9 am, with coffee or wine sometimes served a tad beforehand. Dinner normally was served sometime in the early evening depending on the day’s conflict. Sometimes, both meals were received in the morning, with half slipped into mess kits as reserves for later. Of course, conditions at the Front sometimes prohibited meals from either being prepared or even delivered to the men. It was not uncommon for a soldier to exhaust his reserves, in which case he simply went without until food supplies were replenished from the rear. Front line troops had to subsist on bread, fruit, wine and sausages. Sometimes, troops survived on some form of soup or stew (la soupe or rata), a morcel of greasy meat, hard dry biscuits, and perhaps a cup of coffee. Major mess kitchens were set up near supply railheads and other rear echelon trappings, such as hospital posts, rest camps and training areas. Soldiers who were line infantrymen might also be cooks or food laborers, with fatigue details assigned on a rotating basis. The concept of mobile field kitchens ensued with meals prepared behind the lines, which would then be hauled to the trenches in large food transport tins with carrying frames similar to backpacks. These kitchens were dubbed roulantes (“rollers”), and they rendered certain camping implements superfluous. Stationed in the rear or in support or supply lines, rollers were staffed by cuistots (“cooks”) who stayed with the kitchens to prepare the meals. Though the food was prepared in field kitchens, the task of transporting food to the Front fell to fatigue men quasi-organized into ration parties. 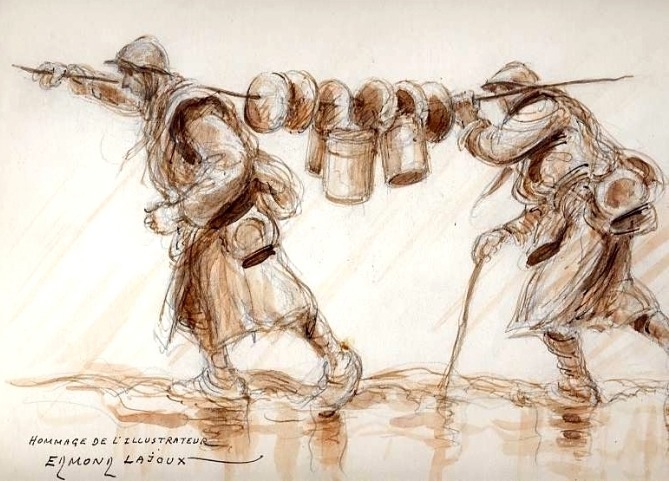 Variously called cuistots, ravitailleurs or hommes-soupes, they brought up the rations on their backs to their waiting comrades. Bedecked with stew pots, mess pans, canvas buckets, sacks, loaves of bread and dozens of filled canteens, the ration parties would usually depart during the night to ensure enough time for them to return by morning. Cooked food was placed in Bouthéon stew pots, a label morphed to bouteillon (“bottle”) due to pronunciation proximity. A large camp mess pan called the plat-á-quatre (“plate for four”) could also be used to carry food to the Front. Loaves of bread were carried either by stringing the loaves together with twine to make a bandolier or by impaling them onto a stake and hoisting them over a shoulder (see above). Canned foods were carried either in haversacks or large canvas distribution sacks. Though the food was hot when it was in the rear, by the time it arrived at the front it had already turned lukewarm or usually cold. The beverages, such as pinard, coffee and water were brought up in individual canteens as well as in the bouteillons or canvas buckets. Not only were these journeys tedious, the hommes-soupes details were often considered more hazardous than combat, as ground covered by enemy artillery fire and machine guns had to be traversed while adroitly carrying bulky equipment making it difficult to seek cover. Food that arrived at the Front was generally chilly, of dubious nutritional quality, often soiled, sometimes spoiled, usually overcooked, greasy, and nearly inedible. Bread was usually carried without wrappers, coffee (le jus), pinard, and soups or stews with beans or potatoes were transported in open cans and the like. The overall quality and invariance of diet was a constant source of complaint among soldiers. Fine dining it was not, far from a beatific merger with “the All.” Most troops would have been flatly elated at a deep platter of warm cassoulet — a rustic, one-pot meal from southwestern France. Afterwards, death would be more embraceable. Boil beans, bacon, and water in a heavy, large saucepan. Then place peppercorns, cloves, thyme, parsley, and bay leaves on a piece of cheesecloth, bundle with twine (bouquet garni) and add to pan. Reduce heat to medium low and cook, covered slightly, until beans are tender, about 1 1/2 hours. Discard spice package and transfer beans and cooking liquid to a bowl. Cover loosely and set aside. Season duck breasts with salt and lightly with pepper and place breasts, skin side down, in a sauté pan already heated over medium high. Cook, without flipping, until fat is rendered and skin is crisp, about 5–6 minutes. Set aside on a board or platter. Cook sausage, turning once, until browned, about 3–4 minutes. Transfer to a cutting board and slice 1/2″ thick on the bias. Season the duck drumsticks and thighs with salt and pepper and working in batches and cook, turning as needed, until fat is rendered and the duck is nicely browned, about 5–7 minutes. Set aside on a board or platter. Add garlic cloves and onions to the pan and cook, stirring occasionally, until golden, about 15 minutes. Now return the sausage, drumsticks, and thighs to the pan and add the stock, confit, tomatoes, salt, and pepper, and bring to a boil. Reduce heat to medium and cook until duck is tender, about 1–1 1/2 hours. Using a slotted spoon, transfer sausage, drumsticks, thighs, and confit to a glass bowl and reserve broth for later. Preheat oven to 375 F. Rub a large, heavy Dutch oven with some, but not all, of the duck fat. Using a slotted spoon again, layer the beans, sausage, drumsticks, thighs, and confit and pour 1 cup of reserved broth over the top. Slice duck breasts 1/4″ thick on the bias and arrange over the top. Melt remaining duck fat in a small, heavy saucepan and sprinkle with salt and pepper. Sprinkle optional bread crumb mixture over top of the dish and bake in the oven until the cassoulet begins to bubble, about 40 minutes (otherwise, just omit the bread crumbs). Increase oven heat to 450-500 F and cook until browned, about 3–5 minutes. Let the cassoulet sit 10-20 minutes before serving with sliced bread. Bien mangé! Waiting for a frigid, stark white night to savor some chowder seems futile this winter. The weather has bordered on the absurd here. In the lower 48, temperatures have been freakishly warm particularly from the plains to the east coast, confusing flora and fauna and upending snow resort life. This week was no different with another balmy February stretch and no end in sight to the warmer than usual temps. Cold refused to settle in this year, and a measly percentage of the land has been blanketed in snow. Even rainfall has been lacking. Besides drought, there are downsides to this t-shirt and shorts weather. Our friendly mosquitoes, flies, fleas and ticks may emerge earlier and if the temps remain moderate, and they are given a longer times to reproduce, pest populations could be noticeably larger this summer. Yet another danger looms as plants, tree and shrubs start to grow sooner in response to warmer temperatures and longer periods of sunlight. If fooled by these warmer periods they may begin to bud, shedding their winter coats. Should freezing temperatures arrive, it can prove fatal to some. Some of this aberrant winter weather has been caused by the Arctic Oscillation, a pressure system that drives where the jet stream divides warm and cold air masses across the country. This year, cold northern air was fenced off at higher latitudes than usual which helps explain our warmth and why Alaska has been enduring such a raw, arctic winter. Others have also credited the mild conditions to the La Niña climate pattern, a system in which low pressure systems pull warm air north from the equator. Chowder is a generic name for seafood or vegetable stews and thickened soups, often finished with milk or cream although others prefer briny or tomato based. Debate rages on whose is better. The English word “chowder” was coined in the mid 18th century, apparently from the cooking pot called a chaudière (12th century term from fishing villages along the Atlantic coast of France), traced from the Late Latin caldaria (a place for warming things). The word and technique were introduced in Newfoundland by Breton fishermen and cooks, then later spread to New England. Others claim that the word derived from the old English word jowter (fish monger). Drizzle a slight amount of olive oil in a large heavy stockpot or Dutch oven. Add the bacon first to a cool pan, then heat to medium, and let render for about 15 minutes, stirring occasionally. Using a slotted spoon, remove the bacon from the pan and strew on a paper towel covered plate to drain. Pour off all but about 2 tablespoons of bacon fat. Return pan to stove and add 2 tablespoons butter over medium heat. Add the leeks, onions, celery and garlic to the pan and stir to coat with the bacon fat and butter. Season with salt and pepper, and cook slowly over medium until the vegetables are translucent and tender, about 15 minutes. Remove and discard garlics. Add 3 more tablespoons of butter and when melted, stir in the flour to coat the vegetables and cook for about 3-4 minutes. Whisk in the milk and cream, add bay leaves, season some with salt and pepper, and bring to a low simmer. Slowly stir in some reserved clam juice to taste. Meanwhile, put the potatoes, cheesecloth with herbs, and salt in a pot or large saucepan, add cold water to cover, bring to a lively simmer, and cook until the potatoes are just tender, about 10 minutes. Drain and spread potatoes on a pan to cool and discard the bag with herbs. Remove and discard bay leaves from the chowder. Again season with salt and pepper to your liking. Gently add the potatoes, reserved lardons and then the clams, and simmer about 5 minutes to blend flavors, stirring frequently. Ladle into shallow soup bowls and garnish with chives. Without garlic I simply would not care to live. Confit refers to a meat or vegetable cooked slowly in fat and then preserved in that fat or even a fruit cooked and preserved in sugars and/or salt. The garlic version is sinfully simple. Slather these tender, magical morsels on crusty artisanal bread, or accent soups, sauces, pastas, pizzas, vinaigrettes, mayonnaises, marinades, mashed potatoes, etc. Even purée or smash and spread on fish, beef, pork, lamb or slip them under poultry skin before roasting or grilling. The garlic infused oil is equally versatile with preps and finishes. Put garlic and herbs in medium, heavy sauce pan and cover with olive oil. The oil should just cover the cloves, and the amount may vary depending on clove and pan sizes. Bring to a bare, gentle simmer over low heat and cook until the garlic is tender and pale golden, but not browned, about 40 minutes. Allow the garlic to cool to room temperature while in the pan with the olive oil. Then, using a slotted spoon, carefully transfer garlic and herbs to a canning jar(s). Pour the olive oil over the top, seal tightly and refrigerate for a week or so. The stuff of statesmen and diplomats? Not even Twain or the esteemed dramatist Molière could have concocted such inane political satire. Makes me want to take a long shower, slip into some jammies, pop some popcorn, and tune into Fox “News” or CNN while humming And where are the clowns?…Send in the clowns. Given yesterday’s lunacy and in honor of the ancient Roman orator, linguist and philosopher Cicero (from which ceci was derived), some velvety, soulful chickpea soup seemed in order. Often, solace can be found in legumes. Lightly coat the bottom of a large pot or Dutch oven with olive oil, add the pancetta and bring to medium heat. When the pancetta starts to become crispy, add the onion, celery, carrots, garlic, crushed red pepper and season lightly with salt. Cook the vegetables until they become aromatic and begin to soften, about 6-7 minutes. Do not brown. Drain and discard the water from the soaked chickpeas, rinse them in a colander and add to the pot. Add the chicken stock, thyme, bay leaves and 1 quart of water. Bring the liquid just to a boil over high heat, then reduce the heat and simmer until the chickpeas are very soft and nearly falling apart, about 1 1/2-2 hours. Turn off the heat, season with salt and allow to rest for 20 minutes. Meanwhile, deeply coat a large skillet with olive oil, add garlic cloves, rosemary leaves, and crushed red pepper and bring to medium heat. Remove the garlic once it is golden and before it burns. Then add the cubed bread and cook until just crispy and golden. Season with salt and remove the croutons to a bowl for use later, reserving the garlic-rosemary oil. Add the garlic-rosemary oil to the soup. Purée (in batches if necessary) the soup by pulsing in a food processor or blender. Correct the consistency, if necessary–if too thin, cook some more to reduce, or if too thick carefully add more stock. Taste and adjust seasoning. Ladle into shallow soup bowls, drizzle very lightly with olive oil, then top with croutons and mint.